NAMI Union County – an affiliate of the National Alliance on Mental Illness, will have a psychiatrist from RWJ Barnabas Health speak about Mental Health and Gender Differences on April 23, 2019, 7:30 p.m. The meeting is open to the public and free of charge. RWJ Rahway Fitness and Wellness Center, 2120 Lamberts Mill Rd., Scotch Plains, NJ. For more info call 908-233-1628 or email namiunioncounty@yahoo.com. Free networking event for members! The Clark Chamber of Commerce is the perfect place to network with local businesses while forming a strong relationship with the community. Both the Police Department and the Township of Clark are actively involved with the Chamber, offering a forum for business owners to participate in a dialogue with their municipality. Looking to market your business? During Clark Chamber meetings, each attendee has the opportunity to stand up and promote their business. 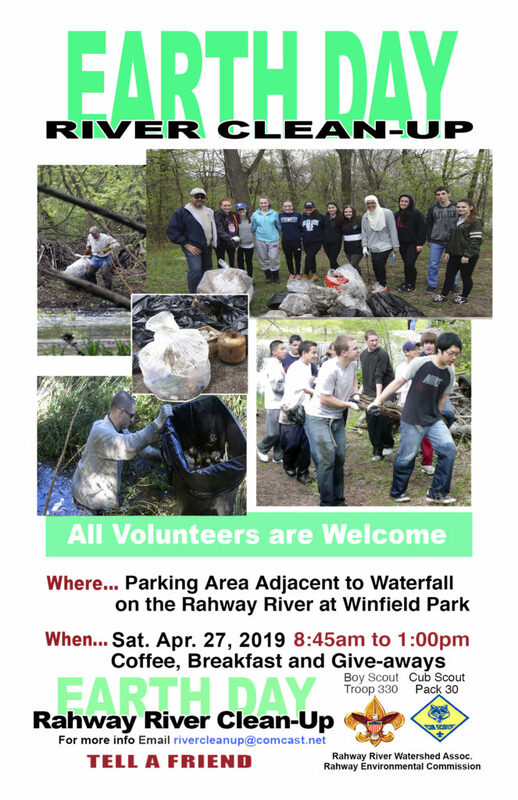 All volunteers are invited to celebrate Earth Day with Boy Scout Troop 330, Cub Scout Pack 30 and members of the Rahway River Watershed Association in a clean-up of the Rahway River on Saturday, April 27th, 2019 (with a rain date of Sunday, April 28th). The clean-up will focus on areas upstream and downstream of the dam at Winfield Park, New Jersey. It is our hope to have enough folks participate that we can have teams work as far upstream as the Garden State Parkway and downstream through Rahway River Park in Clark, Linden and Rahway. Plans are to meet at the parking area adjacent to the waterfall of the Rahway River by the dam at Winfield Park at 8:45 a.m. This is a great way to celebrate Earth Day and if you haven’t participated in an event like this before, you will find it invigorating, and you will feel good about what you have accomplished…it is also fun and educational…especially for scouts and young adults as they always find something interesting. The clean-up will generally be between 9 a.m. – 12 p.m., but any amount of time or effort that folks can volunteer is appreciated. There is always a large volume of floatable debris to pick up. This includes tires and of course floatables (cans, bottles, plastics, etc.). The County of Union generously supplies gloves and garbage bags, and we solicit material donations (donuts, bagels, coffee, bottled water, paper towels, hand-wipes, etc.) for all volunteers. Last year, over 100 folks participated, including girl scouts, cub scouts, boy scouts, fishermen, local activists and citizens, and we pulled some amazing things from the river. Sponsors came through with coffee, bagels, danish, donuts, cookies, bottled water, and juice boxes, and we had grilled hot dogs for lunch. We also had other giveaways for the participants. All participants should wear jeans, long-sleeved shirts, gloves and boots, and waders are welcome for folks who like to get a little wet. Each participant should bring a standard 5-gallon carry bucket with a handle (put your name on the bottom)…this makes for easy carrying of “stuff” for transfer to the large garbage bags. When we complete the event we do a basic inventory of the “big stuff” that we removed….and within approximately 24 hours Union County Parks removes and disposes of all the trash. There is no RSVP required but if you need more information or think you will attend please let us know by e-mail at rivercleanup@comcast.net.